It reads cards, it controls fans, it slices, it dices, and more! A Multi-Panel product providing a variety of functions such as fan controller, card reader, front USB & S-ATA in just one bay. 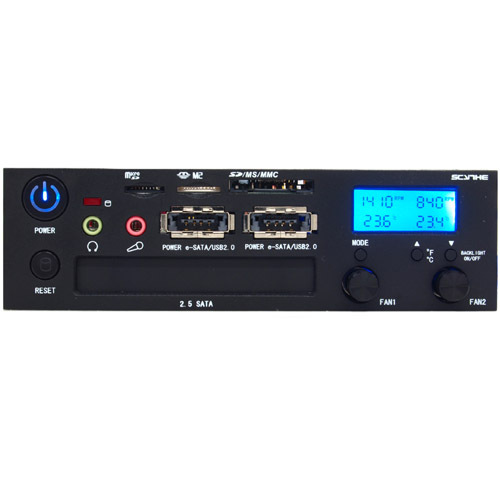 A 2.5" S-ATA Mobile Rack and unique functions such as Reset and Power button of your computer. Fan Controller : 2-channel fan controller with LCD, displaying temperature / fan speed Temperature alert: between 40 and 90 癈 in steps of 1 癈 When temperature exceeds the set value: The temperature displayed will flash and set an alarm. The alarm can be muted by pressing "MODE" button. When the fan RPM cannot be recognized:The RPM displayed will flash and set the alarm. The alarm can be muted by pressing "MODE" button. Retractable Fan Controller Knob makes the Kama-Panel 3 suitable for use in PC-Cases with a door panel. Direct slots for MicroSD/MicroSDHC Card, Memory Stick Micro, SD, Memory Stick, Multi Media Card. Can establish relay connections with the PC case's power switch and reset switch. This allows the PC case switch to be accessible while the power and reset switch of this product is connected. Either switch can be freely used depending on situations for your convenience. This device is compatible to 2.5 inch drives with 9.5mm thickness. Please avoid placing the sensor in between the CPU and CPU cooler. Placing the sensor between the CPU and CPU cooler leads to reduced cooling efficiency and can harm your CPU as well as electrical parts of the sensor.